Railpictures.ca - Mike Lockwood Photo: The classic over/under at Beare. It’s pretty easy to do. First, open two shots in photoshop, one CP and one CN… heh. Ok, it’s legit. CN 2100, 2544, and 5705 lead 149′s train up the grade while CP 142′s crew will be notching up 8712 and 8522 as their tail is now clear Staines. Back in the day, they’d already be rolling pretty good through here, but with 10,000′ or greater trains on the Belleville Sub now, they’re still watching the counter as they approach the crossing with CN. And CN? 10,000′ is so 2001. 1439hrs. | Railpictures.ca – Canadian Railway Photography – photographie ferroviaire Canadienne. Caption: The classic over/under at Beare. It's pretty easy to do. First, open two shots in photoshop, one CP and one CN... heh. Ok, it's legit. CN 2100, 2544, and 5705 lead 149's train up the grade while CP 142's crew will be notching up 8712 and 8522 as their tail is now clear Staines. Back in the day, they'd already be rolling pretty good through here, but with 10,000' or greater trains on the Belleville Sub now, they're still watching the counter as they approach the crossing with CN. And CN? 10,000' is so 2001. 1439hrs. Congratulations, through careful selection, your photo was selected by the moderators to be chosen as one of the latest round of RP.ca Editor’s Choice photos! Excellent shot! Someone was packing the lucky horseshoes in his camera bag!!! It looks like it was staged, like in Model Railroad setting.. But it wasn’t! I’m sure it would get an award on railpictures.net!! Terrific shot, amazing catch, Mike! Congratulations! (I hope you bought a couple of lottery tickets on the way home)! Daniel, I’d wager you’re spot on about the frequency of meets here. There are enough trains on both for it to be a regular occurrence. The trick is to actually be there at the right time, and I’ve logged more hours that most I’d say over the past 20 years and I’m only up to three. I’ve another over/under here, except with empty oil cans on both… and the CN is lead by a trio of BNSF units. Comes from spending way too much time here. IIRC, I have three meets at this location. First one was taken in the late 90′s with far more interesting power (at least by todays standards). But that one was cheating, the CN eastbound was stopped waiting for a westbound to clear into the siding on the other side of the bridge. CP just happened by while it waited. One day I’ll get some sun on a meet here. I think you nailed it Arnold… the odds of getting CP to co-operate and actually runs something makes this shot all the more remarkable. I heard the horn blowing for Ressor Road (CP) and the Beare Dump crossing (CN) and thought ‘no way’. Yes, there was another foamer who got the shot… like me, waiting for the 149 on account of that leader. Seeing it was his third visit to Beare, I think he brought all the luck with him. With about 30 trains a day that go through here, I’m sure it happens several times a year, except railfans are rarely ever present for it. It’s important to think of the amount that railfans actually miss, as it’s not like were trackside 24/7. Which is why I mentioned you would need to camp out for days and photograph everything that went by, including at night. I’m not demeaning this shot in any way. Mike, keep this one in your record books. It’ll be a long time before someone else comes along to post a similar shot. Daniel, this is MUCH harder than you think. 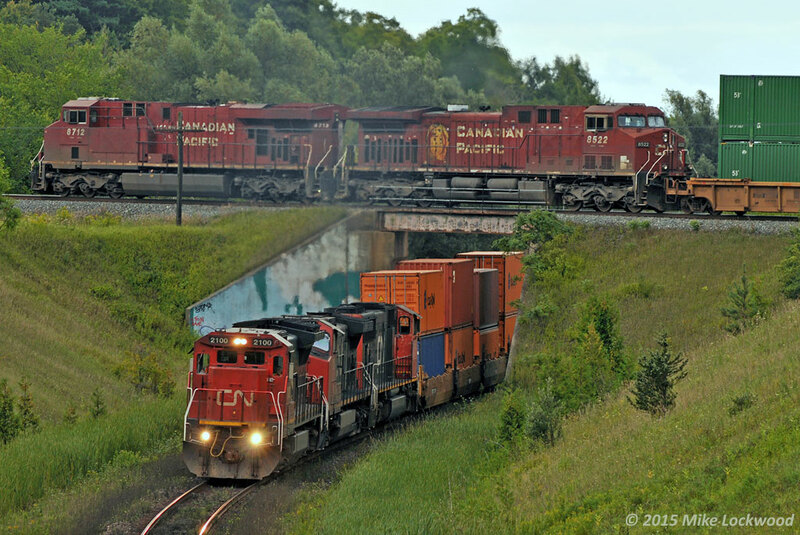 A shot like this one is lucky to get once.. or twice in a lifetime – two freights especially…. And even that – they seemed to only have the one or that was the only one they ever got. And even today, with mainline freights basically half what they once were in numbers and double/tripled in length.. your chances are even smaller to get the head ends meeting. Yeah, Daniel. Timing is everything….as in: Once upon a Time CP sends a train by…….that shot, the more I look at it, the more I cannot believe it is real. Great effort!! Timing is everything. I’m guessing this wouldn’t be that difficult to pull off if you camped out at Beare for a few days. Seriously though, that’s quite the catch! To make it even better, these are rival hotshot intermodal trains. CP 142 is headed from Chicago to Montreal, and CN 149 is headed from Montreal to Chicago. Okay, well they aren’t exactly hotshots, and more like snails. If 142 crossed the border at Fort Erie at midnight (which it usually does), it has covered 135 miles in about 14 hours. If that’s the case, it has maintained an average of under 10mph, which is slower than your regular cargo ship. Lol.